See the enthusiasm, confidence and tenacity on his face? Can we ever be distressed, impatient or complaining for frivolous reasons after witnessing this? 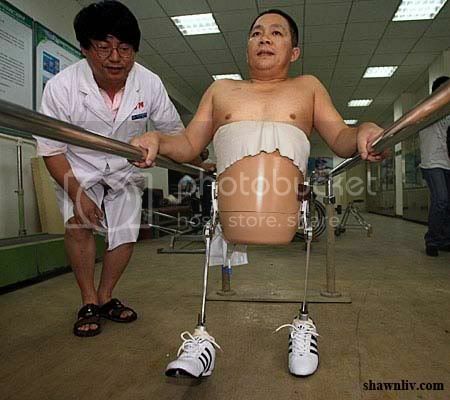 Peng Shu Lin survived against all the odds; now he has astounded doctors by learning to walk again. While his body was cut in two by a lorry in 1995, it was little short of a medical miracle that he lived. It took a group of more than 20 doctors to save his life. Skin was grafted from his head to seal his torso? 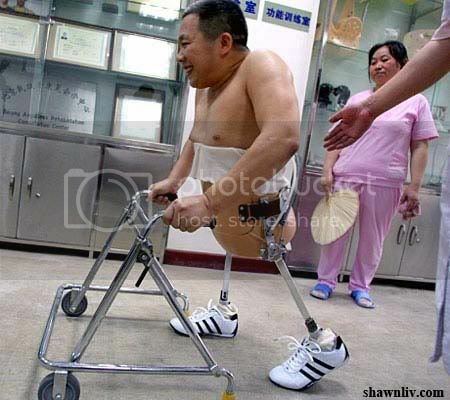 However the legless Mr Peng was left only 78cm ( 2ft 6in ) tall. Confined to bed for years, doctors in China had slight faith that he would ever be able to live anything like a ordinary life for a second time. But recently, he began exercising his arms, training up the strength to carry out everyday jobs such as brushing his teeth and washing his face. Doctors at the China Rehabilitation Research Centre in Beijing found out about Mr Peng’s plight late last year and work out a plan to let him up walking again. They came up with an ingenious way to allow him to walk on himself, creating a complicated egg cup-like casing to hold his body with two bionic legs attached to it. He has been taking his first steps around the centre with the aid of his specially adapted legs and a resized walking frame. Mr Peng, who has to train how to walk again, is said to be delighted with the device. What a Self Confidence !